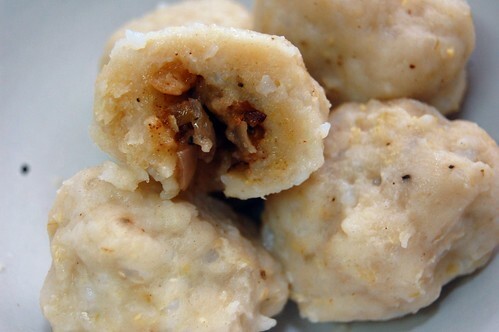 Growing up with an German mother, Bavarian dumplings were not an uncommon accompaniment to main courses of goulash, beef tips and rouladen. To say I was quite fond of these suckers doesn’t really saw much, since I inhaled just about every dinner mom put before me (I was a…. healthy eater). I never really understood how they were made growing up, existing in this nebulous state of origin; with characteristics from several directions. A little potato, a little noodle, a little cake. It was a delicious mystery. Later I came to find out that mother (and her mother and probably her mother, etc etc) made dumplings from a box mix, killing that unknown with a dull thud. I have a few of those very box mixes in my cupboard, of course, because there’s just something about the food you grew up eating that takes you to a warm comfortable place, no matter what it is or how it was made. I am amazed sometimes by the culinary geniuses at some restaurants, but it will never replace my mom’s home cooking. Ever. That being said, I do love stretching my wings, throwing myself into an area of cooking that I have no experience with and very little business trying. I’ve been reading a bit about cooking in the Middle East and Africa (thank you, local library) so I decided to try a dumpling inspired by this reading; not from a box (sorry Mom!). 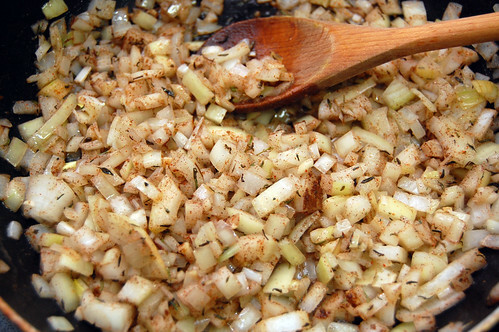 Saute the onions with the butter in a large pan for five minutes then add the garlic and spices and cook for another five minutes. Mix with 1 cup of flour and set aside. Process the rice in a food processor for 30 seconds and transfer to a mixing bowl along with 1 1/2 cup of flour, milk along with salt and pepper to taste. Mix together, adding additional flour until not too sticky to work with (it will still be a bit sticky). Work into golf size balls and then flatten. 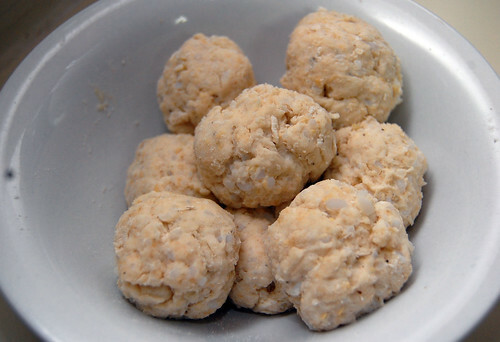 Put 1-2 teaspoons of your onion mixture on your rice dough and wrap around to reform a ball. Boil in water for 30-40 minutes until dough is cooked through. Serve and enjoy.